LGBTQ+ students at Kwantlen Polytechnic University are welcoming the newest member of the Pride collective to the community. 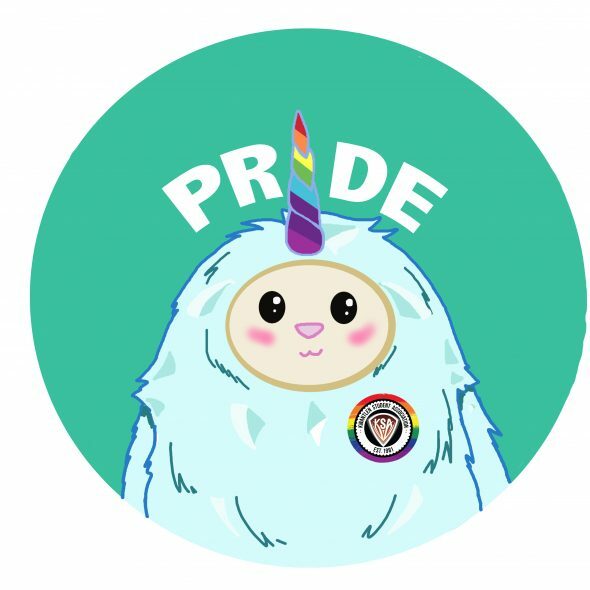 From now on, Q the Yeti will be the official mascot of the Pride Kwantlen collective. Joseph Thorpe, the Kwantlen Student Association’s queer students representative, says that Q is a welcome replacement for the old Pride logo. In addition to being the queer representative, Thorpe is also the Kwantlen Student Association’s VP Finance & Operations. Since achieving that position, he says he has wanted to continue working on initiatives for KPU’s Pride Collective, which is where the idea of introducing Q began to form. In creating Q, Thorpe collaborated with Nicole Kwit, one of the KSA’s office and administration coordinators. She is a graduate of KPU’s fine arts program and currently serves as The Runner’s art director. According to Kwit, the idea for Q’s design was brought about by a desire to give the Pride collective a distinctly unique character that would stand out when representing the group. KPU students’ interest in the Pride collective has been declining over the last few years, most notably after KPU began to renovate the second floor of the Birch Building on Surrey campus, which is where the Pride Kwantlen office was located. The Pride collective’s space was relocated to a different room on the same floor, but according to Thorpe, the door to the new office was broken once the renovations were finished. He says that this made it difficult for students to access the office. Thorpe says that he hopes more students will become aware of the collective when the fall semester starts, and that Q’s intriguing design can help bring more visibility to the LGBTQ+ community at KPU. Kwit says that she may have more designs for characters that represent different parts of the LGBTQ+ community, but for now, Q will stand as a symbol for the community as a whole.